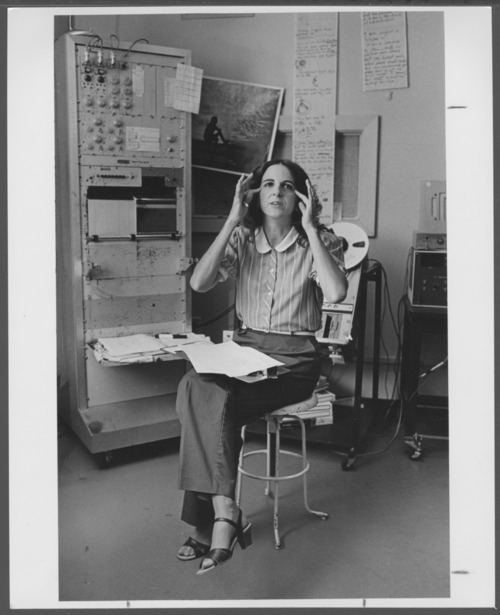 This is a photograph of Judy Spray, Research Assistant, participating in biofeedback therapy. The Menninger Clinic's research section was active in alternative medicine research and treatments. Topics included Biofeedback, Magnetic Field Studies (Copper Wall), and Healers; Studies of the Unconscious, Biofeedback to ease migraine and tension headaches; and biofeedback and brainwave studies to research immunology, cancer, and addictions.